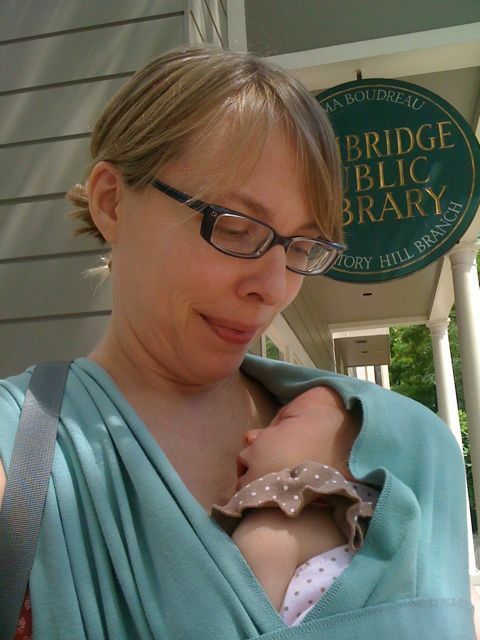 As we live less than a block from the nearest public library, it wasn’t hard to make time for Adie’s first trip. Plus, I finally got the hang of the 16-feet-of-fabric Moby wrap. Other firsts include Saturday’s first cloth diaper, and Sunday’s first Dr. Who episode. This entry was posted on Monday, June 7th, 2010 at 12:37 pm and is filed under ZOMG!!! BABIES. You can follow any responses to this entry through the RSS 2.0 feed. You can leave a response, or trackback from your own site.